Rachel Loewen Walker, executive director for the organization, called the five-year commitment from the federal government for two projects "phenomenal." She noted that OutSaskatoon often struggles year-to-year with funding. "But to have a five-year timeline, to be able to set it up well, build in the evaluation strategies, build up a team, hire the right staff — it gives us an opportunity to really make a difference with this work," she said. The organization provides short-term counselling, social support groups and outreach, along with other programming. 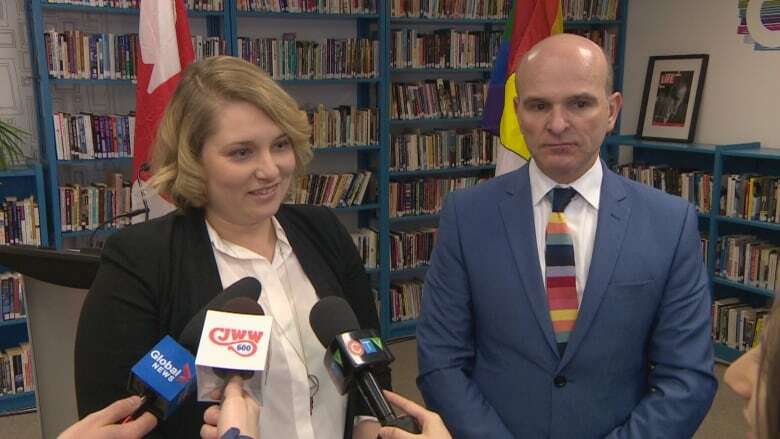 Edmonton MP Randy Boissonnault, special advisor to the prime minister on LGBT issues, was in Saskatoon for the announcement on Friday. He said the issue of ending gender-based violence is important to him personally, as the first openly gay MP elected from Alberta to Parliament. "LGBT people have been invisible in the data in Canadian society since we started collecting the data," said Boissonnault. "It's important that we realize that whatever percentage we are in the population, there's a lot of pain … [and] a lot of hidden violence, gender-based violence, inside the LGBTQ2S community." In Canada, nearly 50 per cent of people aged 15 and over who identify as gay, lesbian or bisexual report that they've experienced physical or sexual abuse, compared to 30 per cent of heterosexual people, according to Statistics Canada. Boissonnault said it's important for the federal government to work with organizations like OutSaskatoon, which has the expertise to help a trans person or queer person of colour who is facing violence from their partners. The money comes as part of the government's federal strategy to prevent and address gender-based violence, which was introduced in June 2017.